In closed center system the hydraulic pump can rest when the oil is not required to operate a function. 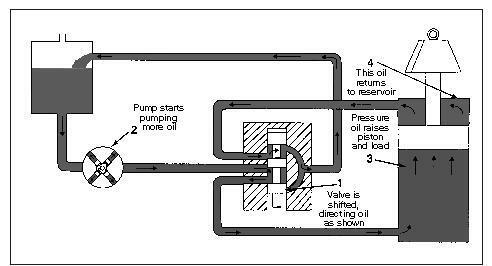 This circuit uses a control valve which is closed in the center to stop the oil flow from the pump. The figure above shows a hydraulic closed-center system. • The system does not require relief valves because the pump automatically shuts off when standby pressure is reached. • The size of the lines, valves, and cylinders can be designed to fit the flow requirements of each function. • Reserve flow can be maintained to ensure full hydraulic speed at low engine revolutions per minute (rpm). • The closed-center system is more efficient on functions such as brakes, which require high force on a very little piston movement. By holding the valve open, standby pressure is constantly applied to the brake piston with no efficiency loss because the pump has returned to standby.